To combat the rising costs of electricity and minimize the headaches associated with frequent bulb and fixture replacements, Kevin Newell of Supreme Foods chose to implement energy efficient EnergyWise LED lighting in his newest Burger King Restaurant. The 10-year savings projections for the project are in excess of $155,000 on electric and maintenance costs. Burger King Store #19097 is the latest and most energy efficient of Supreme Foods’ stores, and one of the most energy efficient quick service restaurants in the U.S. While incorporating energy efficiency measures into the new Burger King helps Supreme Foods reach its’ financial savings goals, it also helps to further emphasize the vision for sustainability that became a priority in early 2013. The EnergyWise LED lighting will achieve greater than 70% electric savings over the standard fixtures and bulbs that were originally specified in the plans. After evaluating the electrical use of Burger King Store #19097 for nine months, it is performing according to expectations, and is the most energy efficient store in the portfolio of stores owned by Supreme Foods. As a barometer, it is only using 56% of the electricity compared with the least energy efficient store in the portfolio. 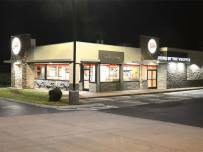 The interior and exterior of the store are well-lit, providing an inviting and secure environment for Burger Kings’ Clarksville, Tennessee patrons to visit and enjoy a Whopper and fries.